...so I decided to ease into it with Tyler Perry and his bumptious, earnest, patchy, draggy, and sort of wonderful I Can Do Bad All By Myself, which admittedly makes all kinds of disappointing choices in editing, story structure, match cutting, and character profiling. (We get it - he's perfect, and he's terrible!) There's nothing in the movie to resemble the pleasingly graceful camera movements in last fall's sudsy but delicious Tyler Perry's The Family that Preys, or the impressively pared-down directness of Perry's own performance in that joint, or the consummate candor and luminosity of Alfre Woodard's performance, especially in close-up. But I'll tell you, I Can Do Bad... still makes for a great kickoff to the weekend. Every critic has got at least a couple of genres that they are willing to indulge, and if you're going to throw this much sisterly charisma and bracing music on the screen, I am going to enjoy myself, even more than during the belly laughs Madea sometimes gets from me when she's threatening to shank some kids. 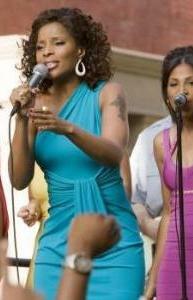 I was hoping that the opening, big-'fro run-through of Aretha's "Rock Steady" really was sung by Taraji P. Henson, who works that multi-threat, Toni Collette-style, funny and crafty and oversized and sympathetic groove in movie after movie (though I think she got Oscar-nommed for one of her weakest performances). Turns out that's steadfast R&B/gospel trouper Cheryl Pepsii Riley doing the actress's vocals, but Henson still lip-synchs the smack out of 'em, and it's a great opening for a movie that gives her plenty of chances to delight in small ways, even if it never goes for broke by really cutting her loose, comically, musically, or emotionally. 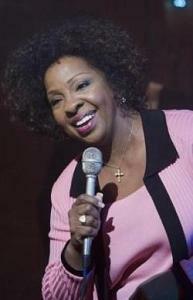 Henson was a big enticement behind my purchase of this ticket (she was great in a second-tier role in Family that Preys), but you usually have to pay more than $6 to get two full-length stage recitals apiece from the legendary Gladys Knight and the legend-to-be Mary J. Blige. Knight, in her modest, controlled, but forceful way, tears up a sort of secular spiritual bit called "The Need to Be," and though I wasn't taken with the title number that gets somewhat obligatorily foisted on Blige, watching this woman sing is as electrifying as listening to her. Her whole body becomes this wild muscle, flexing 101% conviction in every phrase of every song. Her sign-off rendition of her own hit "Good Woman Down" is so thumping and kinetic (the stylish turquoise dress doesn't hurt), that she almost literally blows Henson off the stage and makes you wonder if she hasn't earned the lead role in the next Perry production. In future years, we'll be as happy to have Blige recorded on film, doing her magical thing, as we are having Lena Horne and Billie Holliday tucked away into sublime corners of their occasionally lackluster vehicles. I Can Do Bad All by Myself is, finally, a middling movie, but Perry's protracted attention to these and other musical performances varies the rhythm and dials up the emotional intensity of the film to its incontestable peaks. I stopped even minding about the gratuitous and klutzy flashbacks, which raise questions like, who brings a bag of groceries to work? 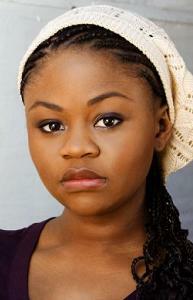 Meanwhile, the other lead story that ought to grow out of this frustratingly uneven but easily enjoyable soap is the commanding performance by Hope Olaide Wilson as a 16-year-old with a barbed-wire attitude and a tough row to hoe. You can sometimes see Wilson wishing that Perry and her other co-stars would rein things in a little and treat the material as frankly as she's doing, but she isn't being a drama queen. It's a forceful and honest performance, sailing over the hurdle of how to hold our attention and our empathy despite being so sour for almost the full 113-minute running time. Complexions aside, she's a dead ringer for Anna Paquin, and I hope she gets the same kind of professional nurturing and career opportunities. And speaking of careers, I've already been peppier and more productive this afternoon by having started my Friday with a party instead of ending it with one. Thanks, Tyler, and thank you, ladies! Praise God for long but flexible hours, and TGIF, everybody. I am glad that there is a great critic like yourself out there acknowledging that there is some worth in Tyler Perry's movies instead of immediately dismissing him without seeing any of his work. I don't think he's Black Cinema's modern saving grace or anything, but he does make solid little crowd pleasers. I do think, though, that The Family That Preys had something going on that shows that with the right push, Perry can do interesting things behind the camera. If you get the chance, I would be curious to see what you think of Madea Goes to Jail. The Madea section, as always, was uproarious, but the dramatic section was also just as interesting. It may be a tad reliant on his usually extreme good/bad dichotomy, but I think he pulls interesting performances from both Luke and Pulliam. Thanks for this spirited riff. Perry is a mixed bag, but what a large and surprising bag it is. I've actually never seen a Tyler Perry film -- though to be fair, I don't think one has ever travelled across the Atlantic -- but your writing makes me so much more intrigued to make his acquaintance than I would be otherwise. Then again, perhaps we won't get on -- I've never liked Mary J. Blige, though I've tried awfully hard. @DJH: We've corresponded off board about this, but I'm still happy to hear from another Family that Preys fan. @Stinky: I already can't wait for that adaptation, if even half the casting rumors are true. @Guy: I can see that Tyler Perry would be hard for int'l distributors to take a risk on. I can't speak to the Mary antipathy; "Enough Cryin'" used to be on daily rotation for me - for about a year. @Luther: I never meant to hurt you—obviously, since I don't even know you. But as Lesley Gore said, it's my blog, and I can "joint" if I want to. Though I admit, your message made me laugh.